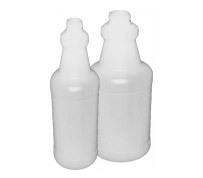 SPRAY CARAFE BOTTLES | Barrier Plastics, Inc.
BARITAINERS®20L, 13L JERRY CAN WITH 70MM NECK FINISH. Kortrax® Barrier Resin based Spray Carafe Bottles can be used to safely transport solvent-based products such as household chemicals, industrial chemicals, cleaning solvents, adhesives, wood preservatives, automotive additives, and agricultural chemicals. They also have superior performance vs. HDPE for Water Vapor Transmission Rates (WVTR) and Oxygen Transmission Rates (O2TR). • Kortrax® Barrier Resin that ranges from 5% to 9% of gross body weight. • The Balance of the gross weight is high molecular weight (HMW) HDPE, 91% – 95%. • Resists stress cracking and aggressive chemicals. • All materials are FDA compliant. • Standard Colors: White, Natural; custom colors available. • 16oz: 192 per box; 15 boxes per pallet. • 32oz: 273 per bundle; 7 bundles per pallet. • Truckload is 30 pallets. For businesses looking for plastic container solutions, Baritainer® would like to send you a sample. Samples are completely free, shipping and handling are not included. In exchange, we ask for a bit of your time and feedback. Just tell us about your business, contact information and 3 survey questions. All your information will not be sold, traded or used for purposes other than intended.